The trend toward "consumerization" marches onward in IT; more and more end-users are choosing their own hardware plaforms and software applications in lieu of the IT-sanctioned business tools provided by their companies. These end-users are looking to tackle issues like data sharing, portability, and access from multiple intelligent endpoint devices, creating a conundrum for IT as it needs to balance business enablement, ease of access, and collaborative capacity with the need to maintain control and security of information assets. This need for balance is one of the drivers of the fast growing online file sharing and collaboration segment of the SaaS market. 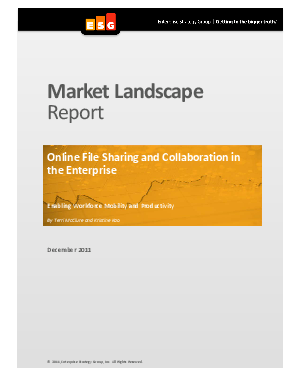 This paper examines the market drivers, inhibitors, and top vendors in this segment, including Box, Citrix Sharefile, Dropbox, Egnyte, Nomadesk, Sugarsync, Syncplicity and YouSendIt.